Adult Swim's silly series takes a new approach—but does the freemium design bite? Each side picks an attack card, and then the results play out. There’s also a quick tap-based timing challenge that can increase—or diminish—the damage of your card. 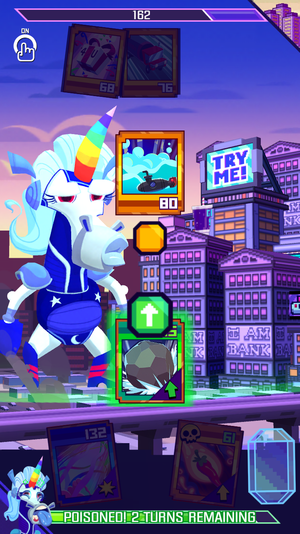 Monsters Ate My Condo kicked off Adult Swim’s colorful mobile series in 2011 with a fun new take on the match-three puzzle game: It had you feed floors of an unstable tower to the giant monsters attacking from either side. And then Super Monsters Ate My Condo took that premise and simply made it faster and sillier. Also free-to-play—and with a pretty friendly design, at that. Given the series’ oddball tone, shifting to a totally new kind of gameplay seems totally reasonable and appropriate here, and Adult Swim and developer PikPok make it work in Monsters Ate My Metropolis. See, Metropolis is no puzzler: It’s a competitive card game, only you’re playing alone and your opponent is a large city. And like most competitive card games—which are built on the premise of buying cards to expand and empower your deck—there are frequent opportunities to spend real money. The player who picks second has a prime opportunity to choose an advantageous card color—but you can still make smart choices even if you’re first. The bright and goofy monsters from the earlier games return, only now you’ll choose one and guide its path of destruction. You’ll do so by building up a deck of cards, each color-coded and unique in its attack style, power, and effect on the rest of your cards. As anyone who played Magic: The Gathering or any other collectible card game (CCG)—physical or digital alike—knows, there’s a science to concocting a quality deck, even one with just 12 cards as in Metropolis. And it’s not the only deck you’re building: A second one is needed to protect your own city. When you play a match in Metropolis, you’re really playing against another player’s deck, albeit controlled automatically by the computer. This means that other players will also challenge your city deck from time to time, so you’ll have to make sure both decks have quality cards. The actual battles have a reliable back-and-forth routine. 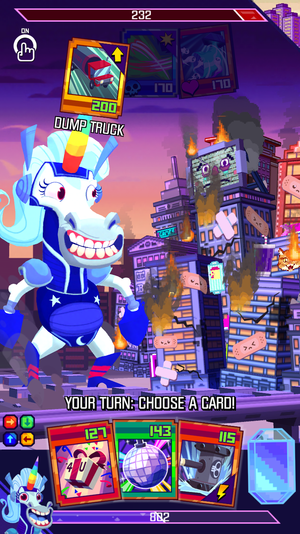 You pick an attack card from the three drawn from the deck, the city you’re facing picks its own attack card, and then the attacks play out and each side’s health bar is diminished. You’ll keep doing that until one of the sides collapses in defeat, although with each turn, the game alternates which player chooses first. Choose your cards wisely! Or, rather—choose to use the paltry cards you’re given, or choose to spend money on better ones. That’s an important detail, since most of the strategy in the game comes from the way the colors play off of each other. The color wheel dictates which cards are more powerful against others, so a green card can smash a yellow one, while a yellow card has a clear advantage over blue ones. You’ll pick it up within minutes, and it’s a crucial detail: If you choose an advantageous card, your attack power will significantly increase, while the opposing card will be dramatically diminished. It’s the biggest key to success in Metropolis: Ignore the colors and you’ll get crushed. But it also feels like one of the only real keys to success in this streamlined CCG. Yes, there’s strategy to building your deck, including having cards that inflict life-seeping poison on the opposing city, or ones that boost your own cards simply by existing in your deck. Aside from being smart about playing colors, the other route to success is simply having better cards in your deck. And unless you want to slowly, slowly grind for them, the game is happy to sell you currency to buy single cards and packs. Collectible card games are a perfect match for the free-to-play model. After all, the physical games are built upon the premise of buying more and more packs to enhance your deck and play experience—and it translates flawlessly to digital. This pops up after every battle, but you’ll probably never earn enough gems to buy OMG!! packs and cards. That’s where in-app purchases come in. 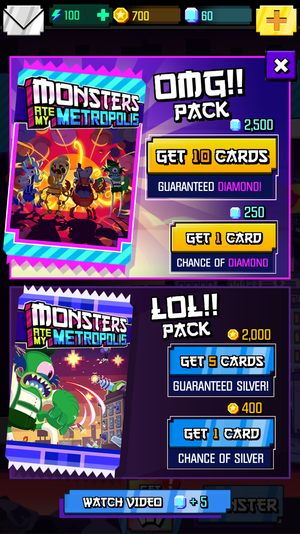 Luckily, Monsters Ate My Metropolis provides a solid experience for anyone not eager to spend cash. You can pick your A.I. opponent with each match, so assuming you choose foes ranked similarly to you, chances are you won’t run into many overwhelming battles. That’s true early on, at least, so you can play the free cards you start with and slowly accumulate through earned coins and gems. But I imagine you’ll hit a wall at some point in your ascent up the leaderboards. Buying packs and individual cards is how you’ll make big gains in deck quality and battle supremacy. A 10-card “OMG!! 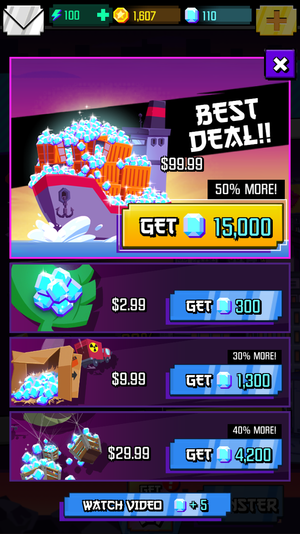 Pack” is priced at 2,500 gems and promises a diamond-level card in the pack, while a single card at that level is sold for 250 gems—with a chance of getting a diamond card. It’s much the same for the lower-level “LOL!! Pack.” You’ll get five cards for 2,000 coins, with a guaranteed silver card in the mix, or you can grab one card for 400 coins and you might draw a silver. Hey, which pack is considered the best deal? Oh right, the $100 one that takes up half the screen. Here’s the big difference in value: You might be able to snag a LOL!! 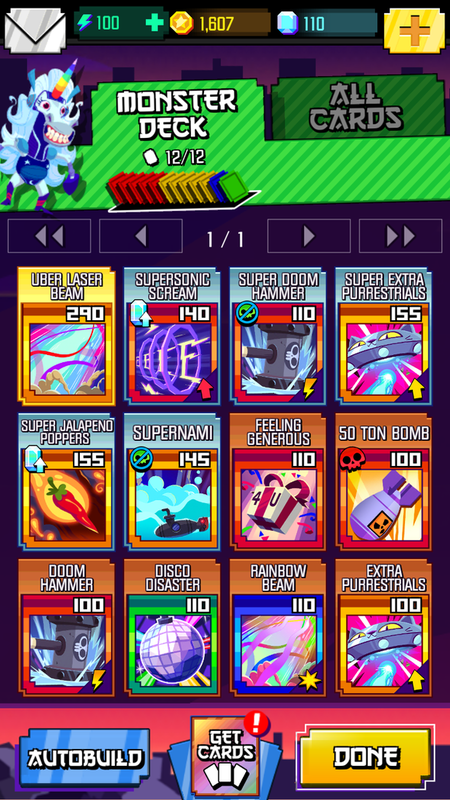 Pack after earning coins from a dozen fights, but you’d have to buy about $20 worth of gems to afford an OMG!! Pack. 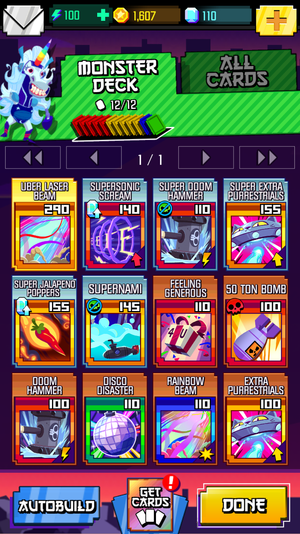 They’re sold in packs ranging from $3 (300 gems) to $100 (15,000 gems), and accumulating them without spending money is a very slow process. For example, you’ll receive just five gems for watching a video advertisement. That’s all. And to compete against higher-ranked opponents, it really feels like you need to have diamond-level cards. Whenever I aimed well above my own ranking, I was frequently crushed by cards several times more powerful than my own. And when I finally spent some money myself, investing $10 to grab a few individual cards on the OMG!! tier, I quickly saw the reward: One attack was twice as powerful as anything I had earned or been given from the outset. That lesson is reinforced very quickly. Monsters Ate My Metropolis has one of the most expensive energy bar refilling costs I’ve seen in a freemium game—$5 worth of gems! Metropolis also has an energy system, with 20 points pulled from your bar (which tops out at 100) with each match. The tally slowly ticks upwards over time, and when your monster levels up—through experience earned in battles, automated fights against your city, or by “feeding” your creature unneeded cards—the meter resets again. 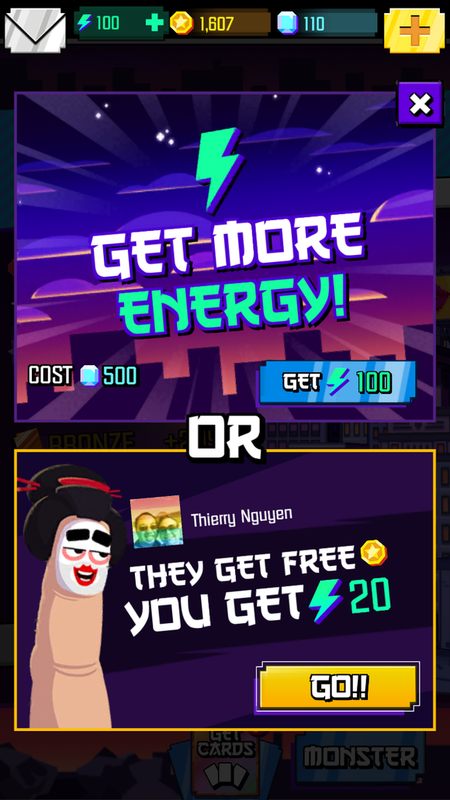 Otherwise, you’ll have to shell out a whopping 500 diamonds ($5) to keep playing without waiting, or bother a Facebook friend to get another match worth of energy. Monsters Ate My Metropolis is amusing and energetic, although the card battling is so streamlined that it lacks enough of a tactical hook. Aside from different cards and more powerful opponents, I felt like I’d seen the game’s entire playbook within a few matches, and that’s not much incentive to keep playing for long—especially without active multiplayer battles or turn-based asynchronous play. Still, the colorful aesthetic does keep things endearing for a while. And you’re not so much paying to win here as much as paying to avoid monotony: The main appeal of spending money is to escape the repetition of using the same deck against the same-level opponents. But given the simplistic combat, I’m not sure it’s worth the amount of cash needed to leap into upper echelon of competition.